Background: This study was conducted to ensure the quality of life and to address the health care needs of this rapidly growing, vulnerable, and heterogeneous elderly population, as the reliable data about their health problems from different parts of India are still lacking. Aims: The aim of this study is to determine the clinical profile of elderly patients of age ≥65 years, admitted in the medical wards at a tertiary care hospital. Settings and Design: Cross sectional study. Materials and Methods: This study was conducted at a tertiary care hospital from September 2016 to August 2018 on 200 elderly inpatients of the Department of Medicine. Statistical Analysis: Descriptive and inferential statistical analysis were used. Results: Of 200 patients, 123 were male and 77 female. The mean age of patients was 72.85 years with a standard deviation of 7.33 years. Easy fatiguability was the most common presenting symptom across all the three age groups with 51 patients (40.2%) in young old, 16 (30.8%) and 16 (76.2%) in old and oldest-old age groups, respectively. Other symptoms included anorexia 80 (40%), fever 64 (32%), vomiting 59 (29.5%), giddiness 41 (20.5%), and weight loss 32 (16%). The system-wise morbidity profile revealed that the most cases had neurological diseases. An average number of ailments per person was found to be higher in the oldest-old age group. Conclusion: Easy fatiguability was the most common presenting symptom in all the three age groups. Neurological, endocrine, and cardiorespiratory diseases were important causes for hospitalization and majority of cases had three or more ailments necessitating hospitalization. Population aging is transforming the world in dramatic and fundamental ways. The age distributions of populations have changed and will continue to change radically, due to long-term declines in fertility rates and improvements in mortality rates. This transformation, known as the demographic transition, is also accompanied by an epidemiologic transition. In which noncommunicable chronic diseases are becoming the major causes of death and contributors to the burden of disease and disability. Global aging will affect economic growth, migration, patterns of work and retirement, family structures, pension and health systems, and even trade and the relative standing of nations. Elderly people are now the most rapidly growing population group worldwide. According to population census 2011, there are nearly 104 million elderly persons (aged 60 years or above) in India. Of which 53 million were female and 51 million were male. Both the share and size of the elderly population is increasing over time. From 5.6% in 1961, the proportion has increased to 8.6% in 2011 and has projected to be 19% in 2050. For males, it was marginally lower at 8.2%, whereas for females, it was 9.0%. As regards rural and urban areas, 71% of the elderly population resides in rural areas, whereas 29% is in urban areas. The age group of 60–65 years, roughly equivalent to retirement ages in most developed countries, is said to be the beginning of old age. Despite a large number of older people, specialized health care has not received the attention it deserves, and Departments of Geriatric Medicine, chronic care facilities and geriatric psychiatry facilities do not exist in India. The challenge ahead for health care in the coming years is to ensure the quality of life to a large group of the elderly population. However, to address the health care needs of this growing numbers of the vulnerable heterogeneous population, reliable data about their health problems from different social settings are still lacking in India. Recognizing the need for reliable data on health problems in the elderly the present study is designed. The study titled “A study of clinical profile of elderly patients admitted in medical wards of a tertiary care hospital in Northeast India” is being done keeping in mind the need for health care in coming years is to ensure the quality of life to elderly population, and to address the health care needs of this growing numbers of vulnerable heterogeneous population, as the reliable data about their health problems from different social settings are still lacking from India. This is a cross-sectional study conducted on 200 elderly patients of age ≥65 years admitted in the wards under the Department of Medicine at a Tertiary Care Hospital in Northeast India, after taking written informed consent from all the participants or from their close relatives/caretakers, and the clearance from the Institute Ethics Committee, from September 2016 to August 2018. Convenience sampling method was applied, and data collection was done on 3 days in a week, on alternate day basis. Patients were divided into three age groups, young old (65–74 years), old (75–84 years), and oldest-old (≥85 years). Patients were subjected to a detailed history taking, complete physical examination, complete hemogram, liver and renal function tests, random blood sugar, urinalysis, lipid profile, serum calcium, thyroid-stimulating hormone level, electrocardiography, chest roentgenogram, and other necessary investigations. Results obtained were analyzed with descriptive and inferential statistics. Results on continuous measurements are presented as mean ± standard deviation (SD) (min–max) and results on categorical measurements are presented in number (%). Analysis of variance has been used to find the significance of study parameters between three or more groups of patients, Student's t-test (two-tailed and independent) has been used to find the significance of the study parameters on a continuous scale between two groups (intergroup analysis) on metric parameters. Privacy and confidentiality of the data collected were strictly maintained. A total of 200 elderly patients admitted in medicine wards were recruited for the study after obtaining their informed consent. Patients were divided into three age groups, young old (65–74 years), old (75–84 years), and oldest-old (≥85 years). 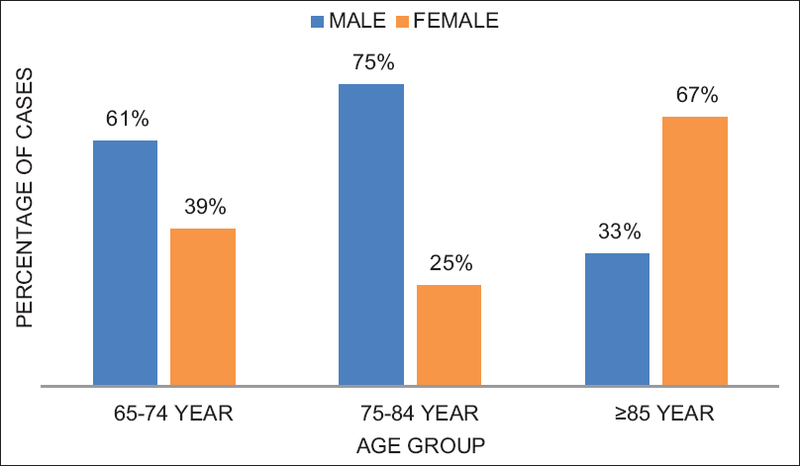 Majority of the patients belonged to the young old age group (65–74 years) comprising a total of 127 of 200 with 77 (61%) males and 50 (39%) females. The mean age of patients in the study was 72.85 years with an SD of 7.33 years similar to a study conducted by Deuri and the mean age across various groups were 68.65 ± 2.64 years, 78.04 ± 2.57 years, and 90.10 ± 3.52 years in young old, old, and the oldest-old groups, respectively. As shown in [Table 1] and [Figure 1], the present study had predominantly male patients comprising 123 of 200, similar to a study conducted by Bhasin and Rao Male preponderance was observed in the young old and old age groups, with 77 (61%) and 39 (75%), respectively. However, female preponderance was seen in the oldest-old age group with 14 (67%) patients. The main focus of the study was to determine the common presenting symptoms and system-wise morbidity among the age groups and to evaluate the average number of ailments per person among the three age groups. Among the 200 patients studied, 81, i.e., 40.5% had routine health check-ups which included 26 (50%) from the old age group. Fair social interactions were present in 115 (57.5%) patients, majority of which was constituted by the young old age group, i.e., 75 (59.1%) patients. About 87 (43.7%) patients had fair nutritional status which included 57 (44.9%) patients from the young old age group. The study also found out that 14% of patients, i.e., 28 out of 200 had a history of active alcohol consumption, and 27% of patients, i.e., 54 out of 200 were active smokers similar to a study conducted by Medhi et al. As shown in [Table 2], constitutional symptoms were the most common presenting symptoms across all the three age groups with 91 (71.7%), 39 (75%), and 18 (85.7%) among patients in young old, old, and oldest-old age groups, respectively. This was followed by cardiorespiratory symptoms (65.5%), neuropsychiatric symptoms (63%), genitourinary symptoms (42.5%), musculoskeletal symptoms (38%), and gastrointestinal symptoms (26%). Among the constitutional symptoms studied easy fatiguability was the most prevalent 83 (41.5%), similar to a study conducted by Prakash et al., followed by anorexia 80 (40%), fever 64 (32%), vomiting 59 (29.5%), giddiness 41 (20.5%), and weight loss 32 (16%). Common cardiorespiratory symptoms encountered were dyspnea 80 (40%), chest pain 49 (24.5%), cough 48 (24%), pedal edema 40 (20%), and palpitation 14 (7%). Common neuropsychiatric symptoms encountered were visual and auditory problems 75 (37.5%), headache 51 (25.5%), weakness of limbs 42 (21%), abnormal speech 39 (19.5%), altered sensorium 35 (17.5%), loss of consciousness 30 (15%), and seizure 12 (6%). Common genitourinary symptoms encountered were dysuria 63 (31.5%), urinary incontinence 30 (15%), and hesitancy 13 (6.5%). Common musculoskeletal symptoms encountered were arthralgia 60 (30%) and myalgia 33 (16.5%). Common gastrointestinal symptoms encountered were altered bowel habits 28 (14%), distension of abdomen 18 (9%), pain abdomen 15 (7.5%), dysphagia 15 (7.5%), and jaundice 14 (7%). As shown in [Table 3], the study found out that most of the participants had neurological diseases 102 (51%), followed by endocrinological diseases 98 (49%), cardiovascular diseases 97 (48.5%), respiratory diseases 93 (46.5%), genitourinary diseases 73 (36.5%), gastrointestinal diseases 46 (23%), hematological diseases 41 (20.5%), and musculoskeletal diseases 31 (15.5%). Common neurological diseases included infarction 46 (23%), demyelinating disease 43 (21.5%), intracerebral hemorrhage 37 (18.5%), central nervous system infection 10 (5%), subarachnoid hemorrhage 8 (4%), intracranial space occupying lesions 2 (1%). Common endocrinological diseases included diabetes mellitus 77 (38.5%) and hypothyroidism 21 (10.5%). Common cardiovascular diseases included hypertension 79 (39.5%), arrythmias 35 (17.5%), heart failure 34 (17%), ST segment elevation myocardial infarction 32 (16%), Non-ST segment elevation myocardial infarction 21 (10.5%), cardiomyopathy 17 (8.5%), valvular heart disease 15 (7.5%), pericardial diseases 5 (2.5%), comparable with the study conducted by Kishore et al. Common respiratory diseases included lower respiratory tract infection 54 (27%), chronic obstructive airway disease 49 (24.5%), pulmonary tuberculosis 21 (10.5%), pleural diseases 20 (10%), and lung malignancy 3 (1.5%). Common genitourinary diseases included urinary tract infection 55 (27.5%), acute kidney injury 39 (19.5%), chronic kidney disease 18 (9%), and renal calculi 15 (7.5%). Common gastrointestinal diseases included gastroenteritis 50 (25%), liver parenchymal disease 22 (11%), gall stone disease 8 (4%), abdominal malignancy 3 (1.5%). Miscellaneous diseases encountered include, anemia 37 (18.5%) and degenerative joint problems 31 (15.5%). [Table 4] shows the correlation of number of ailments with the age group. [Figure 2] shows the average number of ailments per person which was 2.79 ± 1.16. In each age group, it was found to be the highest in the oldest-old age group around 4.23 per person with a SD of ±1.15. Followed by the old age group and young old age group with 2.78 ± 1.02 and 2.55 ± 1.01 ailments per person, respectively. Elderly population is the most rapidly growing population group worldwide. It has a tremendous impact on the health-care system of the nation, affecting the number of hospital beds needed and expert physicians in the field required to meet their ever-increasing demands. It is of paramount importance that unusual presentation of systemic diseases common in the elderly population be identified at the earliest and prompt medical care be delivered for those seeking medical attention to reduce morbidity and mortality. This, in turn, will help our elderly population attain healthy aging. In the present study, of 200 elderly patients studied, the majority belonged to the young old age group (65–74 years). The primary objective of the present study was to determine the common presenting symptoms and system-wise morbidity across different age groups and to evaluate the average number of ailments per person among the three age groups. We found that constitutional symptoms were the most common presenting complaints in all the three age groups, with easy fatiguability being the most common. Neurological, endocrine and cardiorespiratory diseases were important causes for hospital admission in elderly patients. The majority of cases had around three or more diagnoses necessitating admission contributing to higher disease burden in the elderly. Constitutional symptoms were the most common presenting complaints in all the three age groups, with easy fatiguability being the most common. Neurological, endocrine, and cardiorespiratory diseases were important causes for hospital admission in elderly patients. The majority of cases had around three or more diagnoses necessitating admission contributing to higher disease burden in the elderly. Suzman RM, Haaga JG. World demography of aging. In: Kasper DL, Fauci AS, Longo DL, Jameson JL, Loscalzo J, editors. Harrison's Principles of Internal Medicine. 19th ed. New York: McGraw-Hill; 2015. p. 93e1-5. Kalbande DR, Kanawade A, Varvadekar S. Comparative analysis of methods for monitoring activities of daily living for the elderly people. In: Vasudevan H, Deshmukh AA, Ray KP, editors. Proceedings of International Conference on Wireless Communication. Singapore: Springer; 2018. p. 39-48. Roebuck J. When does old age begin? The evolution of the English definition. J Soc Hist 1979;12:416-28. Dey AB, Soneja S, Nagarkar KM, Jhingan HP. Evaluation of the health and functional status of older Indians as a prelude to the development of a health programme. Natl Med J India 2001;14:135-8. Humboldt SV, Leal I. The old and the oldest-old: Do they have different perspectives on adjustment to aging. Int J Gerontol 2015;9:156-60. Deuri A. Clinical and aetiological profile of anaemia in geriatric patients: A hospital based study in Assam, India. Sch J App Med Sci 2016;4:2873-9. Bhasin A, Rao MY. Characteristics of anemia in elderly: A hospital based study in South India. Indian J Hematol Blood Transfus 2011;27:26-32. Medhi GK, Hazarika NC, Borah PK, Mahanta J. Health problems and disability of elderly individuals in two population groups from same geographical location. J Assoc Physicians India 2006;54:539-44. Prakash KG, Devendrappa KR, Madhukumar MH, Priyashree R, Avinash BH. Clinical profile of anemia in elderly: A cross sectional study from a tertiary care centre. Sch J App Med Sci 2015;3:1266-70. Kishore S, Juyal R, Semwal J, Chandra R. Morbidity profile of elderly persons. JK Sci 2007;9:87-9.